I have finished the custom order I’ve been working on since April, or at least the third part of it. It’s an ongoing operation. 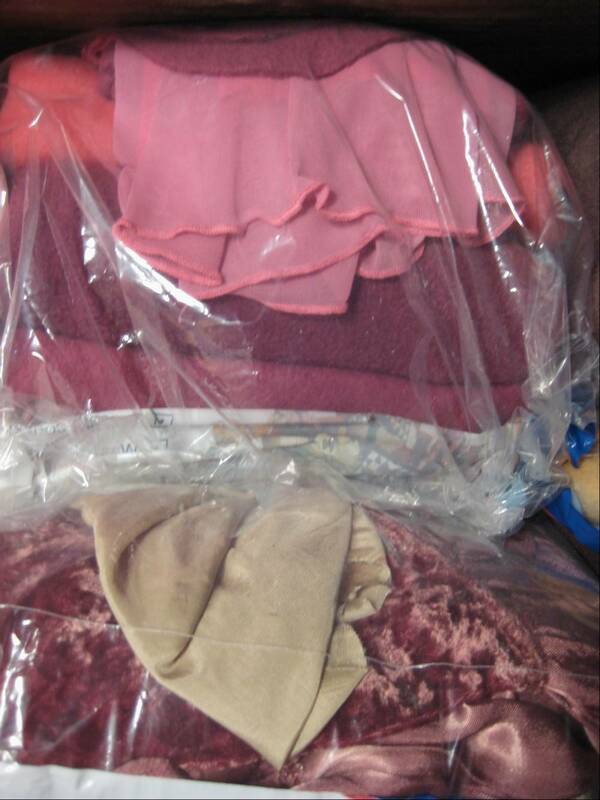 The post office will be an oft visited destination as the letter number pillows are shipped off to Pennsylvania. There may be five or six boxes. Whoo hoo. Look what came in the mail! 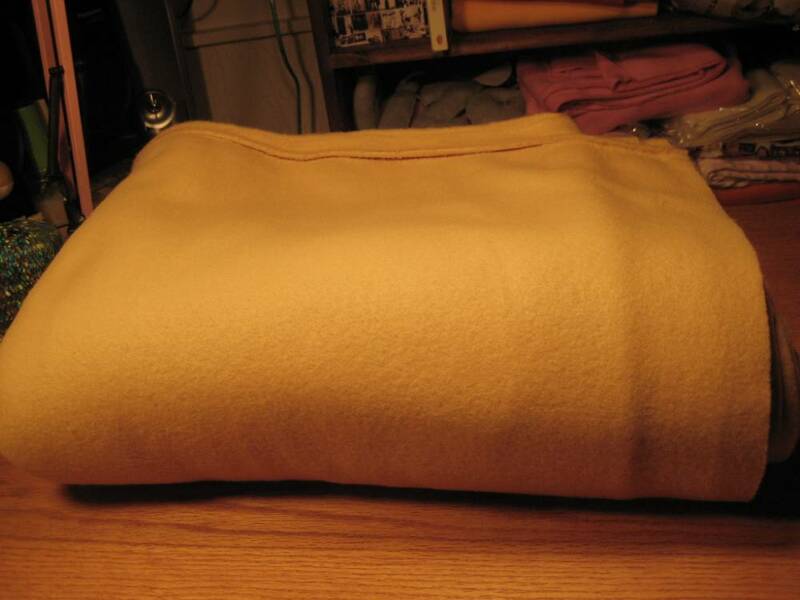 A gigantic lovely lump of butterscotch colored fleece. It is really soft and delicious but the best thing about it is that it is a gift. That dear and sparkling engine of enthusiasm, Miss Emily, the significant other of my dear son Brian, found this fleece to fill the void of my caramel colored fleece, all used up in the creation of donut pillows. I will now be able to make a Maple Bar with red hearts for Emily. 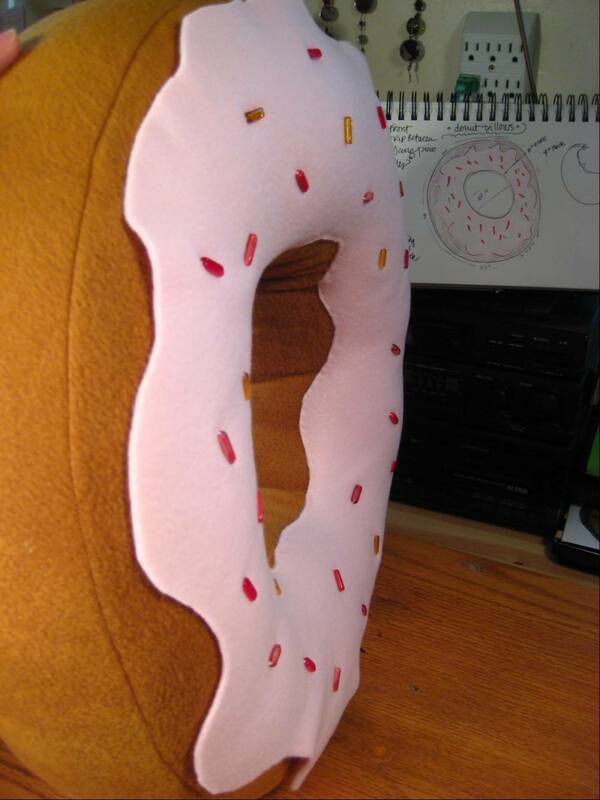 Pink Sprinkle donut, on its side. Yum. Enchanted sweet things and things from the forest and the sea rendered with a measure of glamour ( a spell cast upon the observer) are floating through my imagination. I have chosen this range of color for my fantasy mushrooms and may dip into them to dress the twins — the Darcy dolls I am working up this month. 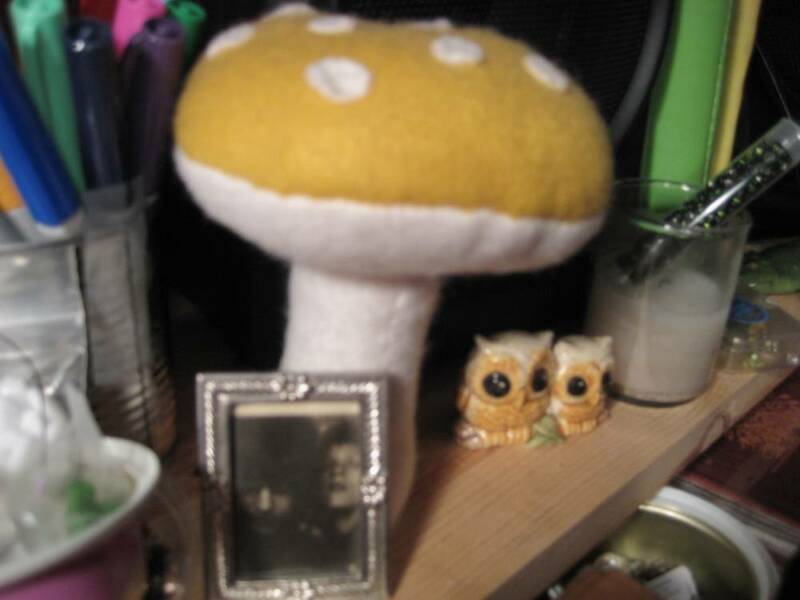 The mushroom series will begin with the giant ‘shroom I’m doing for the Alice in Wonderland ADO challenge. I have the caterpillar with the hookah to do, too. I’m still working on the color of the caterpillar material. I haven’t got it quite right. My doll work was interrupted this weekend by the happy demand for catnip squid. Coincidently, just as my early spring batch of homegrown organic catnip was harvested. 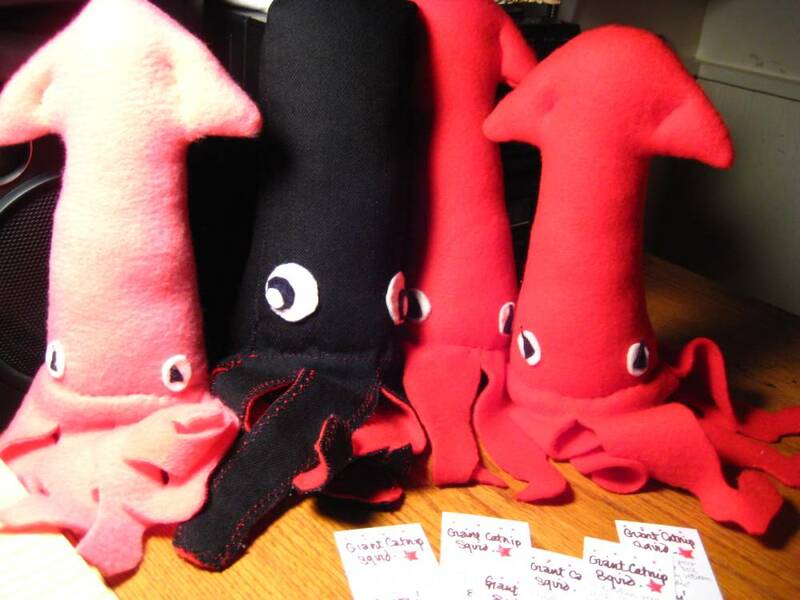 One last catnip squid will be stitched up this morning, readied for the post office tomorrow to go along with a couple of books I’ve sold through Amazon. It’s part of an effort to balance out my book buying habit. Things meant to be read that sit too long untouched are jettisoned. One of these (the black one) is a heavy-duty canvas catnip squid created by request for a woman with Siamese ripper cats. I began to think early this morning as the sun was coming up that I may have found a solution to the ridiculously large black canvas bean bags that are eating up a quarter of the space in our spare room. I envisioned gutting them and cutting the black canvas into many, many heavy-duty squid. On close examination I discovered they have zippers so I won’t have to actually gut them. I do have a deep desire to see all our superfluous abundance transformed. The two giant dog pillows I bought right after we moved into this house, meant to be tossed on the floor in front of the fire, may find themselves transformed into shoulder strapped messenger bags. I’ll use their stuffing for other things. The last time we had a prolonged roaring fire I think we got a touch of carbon monoxide poisoning. I now have candles in the hearth. It’s a fantasy to, machine-like, alter the physical reality of my space by eliminating the unused in this way. A girl can dream, can’t she? 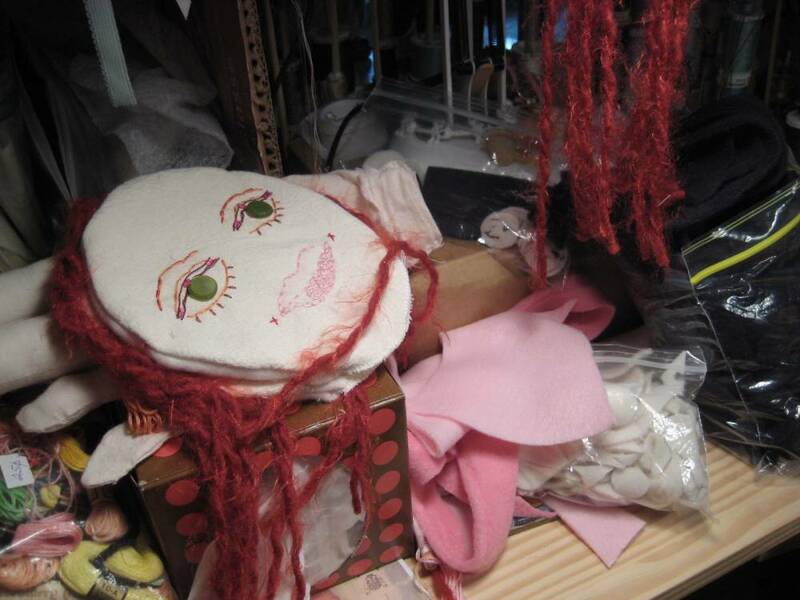 This entry was posted on June 6, 2010 at 10:32 am and is filed under constructions, dolls, etsy, handmade, plush critters with tags dolls, mushroom, post office, squid, work. You can follow any responses to this entry through the RSS 2.0 feed. You can leave a response, or trackback from your own site.